"Im sure gonna miss you sweet lady! I wish I could've seen..."
"Carol was the high school secretary during my years at..."
"Good bye aunt Carol; sorry to see you go, but I know your..."
"Thank-you Mom for bringing me into this strange world, and..."
"Harper says. "I love her." Yes, we all do. Miss you so..."
Carol Annette Waugh passed away with loving family at her side on Dec. 20, 2017. She was born to Carl and Violet Peterson in Ashland, WI on May 21, 1936. Carol grew up in Vancouver, WA along with her 7 siblings after her father was one of the many recruited to work at the Alcoa Aluminum plant. 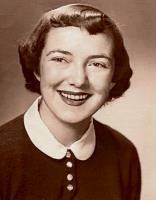 She graduated from Fort Vancouver High School in 1954. After a time working as a meteorologist in Lewiston, ID for the National Weather Service, Carol retired and moved back to Vancouver in 1999 when her husband, Wade, passed away. She volunteered as an AARP Tax Aide and was a member of Memorial Lutheran Church. Carol loved square dancing and round dancing; gardening, sewing, and made beautiful quilts. She was detail oriented and recently finished organizing her life-long photo albums for generations to cherish. was not without a heartfelt HUG. Carol leaves behind her beloved sons, Tom (Chandra), Jim, Dan and Mike (Marilyn); brothers, Wayne (deceased wife Phyllis), Glynn and Jon (Joan); sisters, Jan (Jimmie Howell) and Sharon (Dale Kays); 11 grandchildren; 9 great-grandchildren; and many nieces and nephews. She was preceded in death by her husband, Wade Waugh; parents; infant sister, Margaret Billie; and two brothers, Mitchell (age 14) and Gary (age 74). Carol requested no memorial. Her family will gather on the Oregon Coast this summer as she is laid to rest alongside Wade. is welcomed into God's loving hands. Rest in peace, "big sister." This HUG is for you.